Location:	Eden, Powder Mountain, Snowbasin, Utah, USA (45 miles from Salt Lake Airport); 3 ski areas in vicinity/11 total within 90 minutes of Trapper's Ridge. (1 King + 4 Queens + 1 Queen with 2 twins in bunk room) * Sleeps 14, PLUS full size crib with linens, port-a-crib and high chair available for use with our compliments. WELCOME TO EDEN'S REST! Whatever the season, your search can end here. Beautifully appointed boasting 6 bedrooms and 5 baths, our private retreat is more than spacious enough to host your large group of family and friends, sleeping 14 comfortably. Thoughtfully laid out with two floors of expansive gathering areas, each featuring an HD tv with DVD player. From the best linens to a fully stocked kitchen, we've equipped our home with your needs and comfort in mind. Leave your hairdryer at home, there's one in every bathroom! Every effort has been made to overlook nothing. Winter or summer, the convenience of Trapper's Ridge within Wolf Creek Resort simply can't be beat! About a 15 minute drive from the house, enjoy world class skiing at Snowbasin in winter and in summer amazing trails for hiking and mountain biking (rentals available), outdoor festivals and free concerts. Or take the short shuttle ride up to Powder Mountain. No man made snow here! With 500" of average annual snowfall, this is the crown jewel! Spanning 7000 acres, which is more skiable acreage than anywhere in the United States, it also offers the best intermediate skiing around. About 10 min. from the house is Nordic Valley; fantastic for new skiers and snowboarders to practice their skills and can be seen from most areas in the valley. Once back at the 'rest', dry wet ski gear to a toasty warm in our generously sized ski closet. In summer enjoy golf, horseback riding, a hot air balloon festival or the beaches of nearby Pineview Reservoir where swimming, boating or jet skiing can be the order of the day. Within about 25 minutes in Ogden you'll find awesome and trendy shopping, art galleries museums, and restaurants. Even take in a show or concert at the Historic Egyptian Theater. And at the end of the day the biggest decision you will have to make is whether to dine out or stay home to grill on the porch and soak in our private, in-ground hot tub watching the stars put on their show above. Ahhhh......it's heaven. Though we reside in Georgia, our roots spread far and wide! Just outside the spectacular Ogden Canyon is where our father was born and raised. It was here he learned the value of family, hard work, and perseverance. After serving his country in the Navy, he settled in Georgia. To insure his children and grandchildren, being raised in the south, could experience the splendor of the west that he loves so dearly, he purchased Eden's Rest, and later Big Horn around the corner. Two big and beautiful homes we enjoy so much and take great pride in sharing. In beauty, location, amenities, cost, and not to mention the most wonderful folks around, there simply is no other place that offers what this valley does in every season. In winter enjoy some of the most amazing powder imaginable at nearby Snowbasin or Powder Mountain or learn and practice new skills at Nordic Valley. You'll enjoy the most reasonable lift ticket rates and shortest (if any!) lift lines. Summers are equally grand with days spent enjoying the Trapper's Ridge amenities including pool, basketball and tennis court, hot tub, activities room and gym, or at the lake, hiking, fishing, free concerts at Snowbasin and more. Plan a day in Historic Ogden or adventure further on daily excursions and come back to the house to grill out on the back porch while enjoying the quiet valley. There is something for everyone! toilet, shower, Huge, double+, walk-in shower. toilet, shower, jetted tub, Large walk-in shower plus separate deep, jetted, soaker tub. toilet, shower, Jack & Jill bath features large, walk-in shower. Main floor king master features a HUGE double+ walk-in shower. The main floor front, queen bedroom features large walk-in shower PLUS deep, jetted soaker tub. Jack & Jill has large walk-in shower. Two bathrooms have tub/shower combination; one on the main floor and one upstairs used by the bunkroom. Gas with gas logs. Just a flick of the switch and instant fire. Wireless. Sensitive in winter during snow storms. Work out room and tv located in clubhouse overlooking the mountains and valley. New FULLY appointed kitchen featuring granite countertops and stainless appliances. Large, comfortable, family style dining table. Center island seating with three barstools. Booster seat for use at dining table and, also, a high chair provided for the convenience of our guests. Game table for poker, puzzles, or board games in upstairs gathering area. Board games and puzzles in closet of upstairs gathering area. Trapper's Ridge Community is professionally landscaped and maintained at all times assuring a beautiful setting. Two different water falls in back of house providing wonderful sound. Pineview Reservoir located just below the house where you can put in your own watercraft or rent locally. Comfortable patio table and chairs for pleasurable dining outdoors. Sit either undercover beneath the lanai or on the patio surrounding the hot tub. Snowbasin, Powder Mountain, and Wolf Creek all within a few minutes of the house. Monte Cristo within approx. 30 min. offers the best snowmobiling in Utah. One court located across from the clubhouse. Gorgeous, public course just below the house at Wolf Lodge. Enjoy the incredible views of Pinelake Reservoir with Snow Basin in the distance from the Trappers Ridge Clubhouse pool deck. Enjoy our private hot tub right on the back patio. Regularly serviced, cleaned, and ready before each guest arrival. This place is amazing !!!! Great house for big family's and groups. Great location, 3-car garage, good ski vaacation home, good landlord. Would go back. I have rented homes for over 20 years on VRBO. Hands down this was the best layed out home, with so much room and everything you could ever need. On top of thatthis home isdecorated eautifully. Every edroom had a queen or better.my guys and I just loved it.. The owner Debbie is always there for you. This house is an absolute home run. Spacious, well-maintained, responsive owner, great location. Our group of six 40-yr olds loved the home for our annual ski trip. 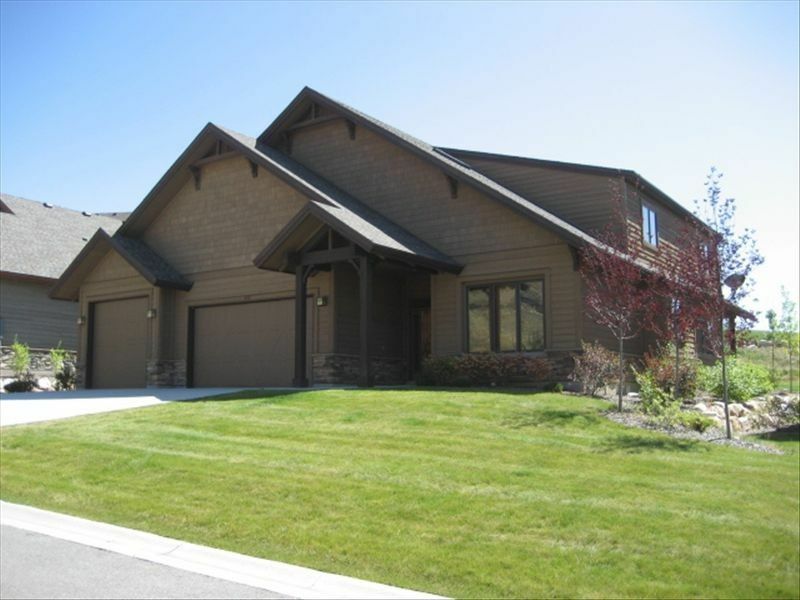 The house is beyond spacious, beds were comfortable, with the huge kitchen, hot tub, fireplace, and heated ski closet creating the perfect storm of creature comforts (along with a separate lounge area upstairs). Along with nearby food and drink options we really did not want for anything at all. The welcome basket of treats for our group was a particularly special touch from Debbie the owner and the entire group was very impressed by it. Will make it a repeat visit when we come out next. Beautiful home in a prime location. Debbie was wonderful to work with every step of the way. She went out of her way to ensure that all of my questions were answered, and offered her assistance to ensure that our stay was perfect. Her home is beautifully decorated, and well stocked with everything you can think of. She was gracious to provide a gift box of wonderful treats. I would definitely stay here again. *Seventh night free with exception of some peak holiday dates. Half of rental fee, plus tax, due at time of agreement. Balance of rental fee, plus tax, due 30 days prior to scheduled arrival. $250 Exit Cleaning Fee, plus tax, and $500 Refundable Security Deposit due 15 days prior to scheduled arrival. My pleasure waiving check in/out time requirements when able, at no additional charge.